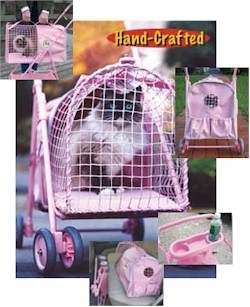 With low prices and top-quality products Cat Palace USA once again comes through with a fantastic pet product that improves the quality of life for both me and my pet. With the innovative KittyWalk Sport Pet Stroller I can get my exercise while my cat can indulge her natural curiosity for the outdoors. This is much safer, and far less harrowing, then the alternative which is to just turn her loose nd then chase her all over the neighborhood. Generally those incidents leave both of us a little out of sorts. But this new stroller, in my favorite color, makes things a whole lot easier for both of us. I don’t have to undergo the stress of losing my beloved pet and she doesn’t have to run around scared in unfamiliar territory. She gets to see the sights with me and we can both relax. What a great idea!